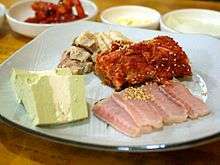 Fermented fish is a traditional preparation of fish. Before refrigeration, canning and other modern preservation techniques became available, fermenting was an important preservation method. Fish rapidly spoils, or goes rotten, unless some method is applied to stop the bacteria that produce the spoilage. Fermentation is a method which attacks the ability of microbials to spoil fish. It does this by making the fish muscle more acidic; bacteria usually cease multiplying when the pH drops below 4.5. Bagoong Filipino Partially or completely fermented fish or shrimps. Fish bagoong is prepared by mixing salt with fish, and placing it inside large earthen fermentation jars. There it is left to ferment for 30–90 days with occasional stirring to make sure the salt is spread evenly. A food colouring called angkak is added to give the bagoong its characteristic red or pink colour. Angkak is made from rice inoculated with a species of red mold (Monascus purpureus). 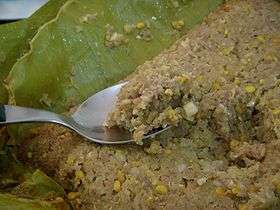 Some manufacturers grind the fermented product finely and sell the resulting mixture as fish paste. A byproduct of the fermentation process is a fish sauce called patis. Fish sauce Asia Clear light or dark brown liquid produced from salted fermented anchovies (Stolephorus sp.) 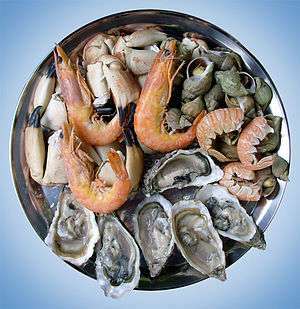 or other fish or fishery products such as squid, shrimp and shellfish. The fermentation period is usually half a year or more, up to one and a half year (the longer the better). Local names are: Cambodia - nuoc mam; China - yu lu, xing tang, yee su; Indonesia - ketjap ikan; Japan - ishiri, ishiru, shotssuru, ikanago; Korea - aekjeot; Lao - nam pla; Malaysia - budu; Myanmar - ngapi; Philippines - patis; Thailand - nam pla; Vietnam - nuoc mam. 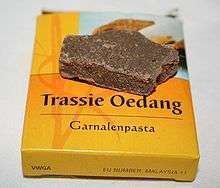 Trassi (terasi, terassi) Indonesia, Malaysia Dark blocks made from dried fermented salted paste from tiny shrimp (trassi udang) or small fish (trassi ikan). 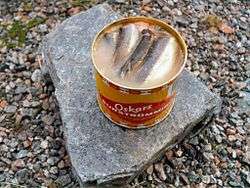 Fermented fish are highly popular in Northeast states of India and Bangladesh. 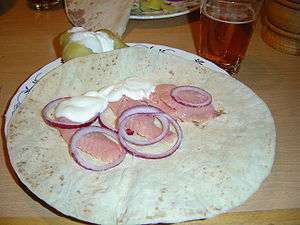 There are several products traditionally prepared in the region viz. Shidal or seedal- prepared from small carp (Puntius spp.) is a product of Assam and Tripua (Northeast states of India). Fish is fermented in earthen pots for about 6 months and the final product is solid with sticky surface and strong pungent smell. It is eaten after elaborate cooking and prepared dishes like vegetable mix curry or chutney, and eaten as condiment with rice or chapati. 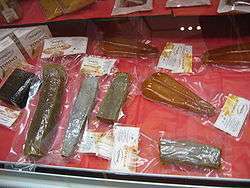 Other products are tungtap of Meghalaya, Ngari of Manipur and numsing of Assam. They are also similar products. ↑ Ababouch, Lahsen (2005) "Preservation techniques" FAO Fisheries and Aquaculture topics. Rome. Updated 27 May 2005. ↑ Alzamora, Stella; Tapia, Maria Soledad; López-Malo, Aurelio (2000). Minimally Processed Fruits and Vegetables: Fundamental aspects and applications. Springer. p. 266. ISBN 978-0-8342-1672-3. 1 2 "Why does Alaska have more botulism". Centers for Disease Control and Prevention (U.S. federal agency). Retrieved 18 July 2011. ↑ J. Dagoon (2000). Agriculture & Fishery Technology III. Rex Bookstore, Inc. pp. 242–243. ISBN 978-971-23-2822-0. 1 2 National Research Council (U.S.). Board on Science and Technology for International Development (1988). Fisheries technologies for developing countries: report of an ad hoc panel of the Board on Science and Technology for International Development, Office of International Affairs, National Research Council. National Academies. p. 163. ↑ Chris Rowthorn, Greg Bloom (2006). Lonely planet: Philippines. Lonely Planet. p. 147. ISBN 978-1-74104-289-4. ↑ Priscilla C. Sanchez (2008). Philippine fermented foods: principles and technology. UP Press. p. 424. ISBN 978-971-542-554-4. ↑ Home Economics and Livelihood Education 5. Rex Bookstore, Inc. 1990. p. 409. ISBN 978-971-23-0033-2. ↑ National Research Council (U.S.). Panel on the Applications of Biotechnology to Traditional Fermented Foods (1992). Applications of biotechnology to traditional fermented foods: report of an ad hoc panel of the Board on Science and Technology for International Development. National Academies. pp. 132–133. 1 2 Herz, Rachel (28 January 2012). "You eat that?". Wall Street Journal. Retrieved 30 January 2012. ↑ Jeyaram K, Singh TA, Romi W, Devi AR, Singh WM, Dayanidhi H, Singh WM and Tamag JP (2009) "Traditional fermented foods of Manipur" Indian Journal of Traditional Knowledge, 8 (1): 115–121. ↑ Thapa N, Pal J and Tamang JP (2004) "Microbial diversity in ngari, hentak and tungtap, fermented fish products of North-East India" World Journal of Microbiology & Biotechnology, 20: 599–607. ↑ p. 69, Subsistence salmon fishing in Nushagak Bay, Southwest Alaska, Jody Seitz, technical paper no. 195, Alaska Department of Fish and Game, Division of Subsistence, Juneau, Alaska, December 1990. Page 68. ↑ p. 5, Botulism in Alaska, a guide for physicians and healthcare providers, 2005 update, State of Alaska, Department of Health & Social Services, Division of Public Health, Section of Epidemiology.